I decided to start a review for this boot, with the hope those whom have greater experience in XCD skiing could offers comparisons and contrasts to other boots. I can offer no scale or point of reference. I only can offer my review as to how this boot has performed for me, and review of the boot's physical characteristics. While this boot is UK military surplus, it is far from old junk. My boot came with a date of October 2011, along with other inventory information on the box, so it is not old at all. The boot is Vibram sole, welt construction. It has a thin rubber rand sealing the sole and running up onto the upper approximately one inch. Hopefully this rand will protect the stitching from wicking for a long time. There is no way this rand could affect flex or fit in a noticeable manner. The rand is too thin, and the leather and padding too thick and strong to be affected by a rand as thin or really thinner than an inner tube. The upper appears to be thick, full grain cowhide. I am not an expert, but it is high quality leather. I could spend $200.00 for work boots and not get near the quality. The boot has Thinsulite insulation, quantity unspecified, and a Cambrelle liner. The boot comes with an approximately 1/8" wool felt insole. The boot comes about an inch and a quarter above my ankle, with the leather upper ending just above my ankle. It has a padded nylon collar, which I would consider a light gauge Cordura like material. The boot has six lace eyelets, three D-rings at the bottom, a lace lock hook above the instep, in the exact location where you can lock the heel down, then you have a sliding hook and another locking type hook at the top.This is a heavy boot with a stiff sole. It is warm. Sizing is British. I am an 11 US and ordered a 10. I received a 10W, and was quite concerned. The felt insole took up the extra volume and they fit quite nicely. For comparison I wear a T-4 in a 28.5. I do not wear wide well, if the insoles wear out, I believe I will need to find another insole to take up that volume. I have skied this boot on some S-112's and a pair of 200 cm Asnes USGI skis. The sole is very stiff, however my point of reference are T-4's or recreational cross country "tennis shoes" of years past. These boots offer ankle flex and I very much enjoy them compared to T-4's. I can really fly on the USGI's, I even made pretty good time on the 112's with good snow conditions. I get good range of movement on the "click 1" position. That is what I can offer about K&G performance. Now when I get to the places where I can point them downhill this boot really performs. I can easily get right on the BoF with this boot without cable or hardwire assistance. I believe I could handle more ski than a 112 going downhill with this boot, and sooner or later just as an experiment try this boot with my old alpine mid- fats. I do not have any problem flexing on the BoF to make turns, but the sole is stiff it does not give torsionally, you can put a ski on edge and hold it. I recently was on my a-- a lot of times skiing my USGI's on wet granular over boilerplate. It was not that I couldn't turn that ski over and get edge control on the ice. It was that I had difficulty finessing a skinny double cambered ski in the conditions. In closing I will say that I wait for others to offer more educated reviews of K&G performance, and I look forward to their comparisons to other boots. I think this boot is far more comfortable and efficient than a plastic boot. I have only gone ten miles on them at a time, not that I consider that very far, but for me their weight is not an issue. The stiff sole easily turns the 112 and I am quite confident I could turn a larger ski. While the boot seems to offer good ankle support, I am actually tying these with a surgeons not above the instep, then skiing with a loose ankle. My heel stays down, I get a lot of range of movement, and as long as I stay centered on top of my skis, turns are sweet. If I loose that balance, I need to get back in balance, but that doesn't change even on alpine gear. You just reach a point in your skiing life when you know you are on the ski. This boot allows my to stay on the ski with just a 3-pin binding going downhill. I can't do that on my T-4, I find I need that hardwire. The resort is more suited to plastic with the hardpack and ice you may encounter. In natural snow, going downhill, this boot has a pretty high ceiling. I look forward to finding how far I can push it. I would describe them as old-school leather Telemark touring boots. I think of this class of boots as the old-school leather version of Telemark boots like the T4 and Excursion. The sole is remarkably stiff-flexing and very supportive. The full-grain leather upper are thick and very supportive. As you describe they are low-cut, for touring comfort and efficiency. I suspect that they will take me many miles to break in properly. I plan to do this with much TLC and much boot treatment. Once these boots are broken in they should be incredibly comfortable and supportive. I am pleased to read that they are decent XC boots. I plan on using them primarily for more mellow distance-oriented tours on big powder skis. Like you- I have T4s for more challenging downhill skiing. Your report on their exceptional downhill performance is great news as well- I expect I will be using them as a downhill boot more than I thought- especially in deep, soft snow. I bought the size "8"- they are probably a tad bit short on my longer left foot- but they should be fine. A size "9" would be enormously too big on my small volume feet. I typically am a 9US/42.5EU. I intend to use these on my next steep and deep kit- along with my T4s as running mates! Lilcliffy, I hope you find them at least acceptable as a K&G boot. I just came back from a loop on some pretty thin cover, mostly packed from foot traffic. My son was developing a blister, and it was getting closer to dark. It was only about a mile and a half to the truck, but I told my son to wait at another trailhead and I would be right there for him. I have never XC skied so fast! The USGI's on hardpack, but preserved, boots with ankle flex, click 1, and blue wax. If they aren't even an acceptable XC boot let me know, that would be enough to buy some Alaska's and NNN! I have no doubt that will break into fantastic BC-XC boots! My move towards NNNBC for light-duty BC Nordic touring was not because I was dissatisfied with NN-3pin- it was because I ended up finding readily available NNNBC boots that I preferred to their 75mm counterparts. If I could have bought a new pair of Asolo Extremes- to replace my old ones- I might have never given NNNBC a decent shot- and might be another stubborn old-schooler shooting it down! I bought the Ski March because I no longer had a leather NN-3pin boot- and although I am happy using my T4s on truly steep terrain- I can't bear to put a 3pin binding on a Nordic ski without at least one leather boot to float on it! If I can get the Ski March broken in where I want it- it will be the perfect mate for my T4s. Steep and deep ski, based on my experience with an S-112, and a USGI. The Objective is a huge 1 lb. 14 oz. lighter than the Vector, and only 4 cm not as wide at the shovel. Sounds like a no brainer for the Objective, but not for me. The Vector is 12 cm wider at the waist, and has a 23 m turn radius as opposed to a 19.5 turn radius. For soft snow I think straighter is better. I wouldn't worry about the Vector being a turning ski. I fully accept Connyro stating it is a turner, that is good enough for me. The trees grow tight in the woods in his area, the photo you shared from New Brunswick reminded me of the UP in MI. Here is where I throw the real curve ball. Regardless of the ski I choose, I am leaning toward a waxable ski. We are talking about a powder ski, correct? I am finding that wax sticks pretty good to snow 30 degrees and colder, and it is a lot more fun than scales. I have been trying to use as cold of wax as possible, and I have been extending the wax pretty far forward. The wax seems to last pretty well. I would not feel put out if after quite a few miles to add wax on a single camber ski like the Vector. I think that the 96 mm waist on a Vector would offer a lot of grip with wax, and when it didn't perhaps a narrow skin would be a good back up plan. I actually think I know of a knowledgeable skier in NB whom could give me an idea how narrow to cut a skin that attached at the tip, and most likely cut at the skier's heel. The binding I would chose would be based upon my plan to turn this ski with the Alico boot. I would probably go with the 3-pin cable traverse. I think I would want the riser for a wide ski like the Vector. I would like see how the Hardwire works with leather, and they would be a better option to allow plastic boots also. I have HW's, I just have not hooked them up to the leather boots. The other binding I am curious about it the 3-pin Spike. I am curious as to it's advantages. There are a lot of Vector skiers out there. Tell me why I would want a Vector BC over the waxable? If I am skiing in conditions that favor scales, I have an S-112, and they rip corn. I really hope to hear some perspectives. I have been thinking about this for a while. fisheater wrote: Regardless of the ski I choose, I am leaning toward a waxable ski. We are talking about a powder ski, correct? I am finding that wax sticks pretty good to snow 30 degrees and colder, and it is a lot more fun than scales. I have been trying to use as cold of wax as possible, and I have been extending the wax pretty far forward. The wax seems to last pretty well. I would not feel put out if after quite a few miles to add wax on a single camber ski like the Vector. I think that the 96 mm waist on a Vector would offer a lot of grip with wax, and when it didn't perhaps a narrow skin would be a good back up plan. Although I have tested many different "Telemark" boots and bindings at demo open houses- the only true "Telemark" binding that I have a lot of experience with is the 3-pin cable (I have been skiing with it for some 25 years). Just picked up my pair at the post office today. Wow, seems like great quality and craftsmanship. Incredibly stiff. Great fit. Just waiting to be broken in. Reminds me of my leather B17 Brooks bike saddle. And just as stylish. Can't wait to attach them to the BC125s. In the meantime I think they're nice enough to where to town! After reading these reviews, how could I *not* buy a $65 raffle ticket? Quality is so good (right up there with Crispi Antarctic imo, although this is a much beefier boot), I'm buying again. 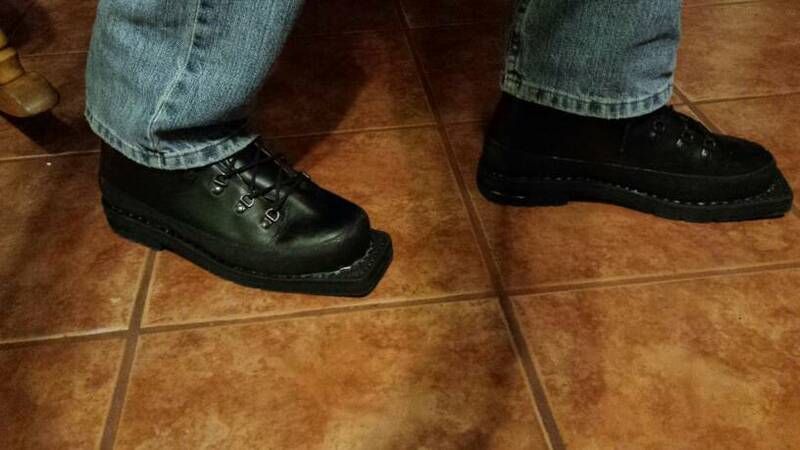 Alico makes great stuff, I wear my Summit hiking boots every day. They use the best leathers (except for the "Glide" boots). These Ski March look extremely durable. How often do you get a chance to have the British government subsidize your ski equipment? It's the only ski boot in existence that comes in wide sizes too. I read somewhere that the Swedish military uses Alico Double boots. I've been out a few times on my second round of Ski March boots. So far, so good. This second par came from a different source, 2009 vintage, and not as well kept. More "new, very old stock" than new. So after a thorough soaking with Lexol, then rubbing in a bunch of Obenauf's (similar to sno-seal), we begin the (long, arduous) break in process. The super stiff sole makes these very high heel blister potential, at least initially. Moleskin or ezeefit liners recommended. These are my first leather boots. They seem the perfect compliment to my 145 Hoks (my main reason for buying). They're warm, dry and reasonably comfortable, but they will benefit from a real footbed and long break in.